Summary: When Isabelle Poole meets Dr. Preston Grind, she’s fresh out of high school, pregnant with her art teacher's baby, and totally on her own. Izzy knows she can be a good mother but without any money or relatives to help, she’s left searching. One of my many highlights at SIBA last September was meeting Kevin Wilson, author of FAMILY FANG. He was there to take about his new novel PERFECT LITTLE WORLD, and he was absolutely delightful. He talked about how hard it was to be a parent... and how it would be great if he could have some "help" from other parents to raise his kids. And that's how the idea behind PERFECT LITTLE WORLD began percolating in his mind! PERFECT LITTLE WORLD tells the unique story of Izzy, a teenager who finds herself pregnant to one of her high school teachers. Her mother died when she was young, her father has basically checked out, and she's pregnant and all alone. Isabelle wants to keep her baby, but she isn't sure how she's going to manage with no family help and a job as a pork barb-b-quer. And that's when Dr. Grind enters the picture. He is a child psychologist who focuses on families, and he's trying something very new called The Infinite Family Project. He wants to create an ideal world where ten children are raised collectively on a compound for then years... and when I say collectively, I mean that none of the kids know who their parents are! Dr. Grind asks Izzy and her baby boy to join the group; and Izzy feels as if she has no choice but to enter the project. At first, things work out pretty well, but as is the case of most families, the dynamics aren't always pleasant. Couples have marital issues, friends stop getting along, funding becomes questionable, and parents find that they love their biological children more than the others. In addition, Izzy finds herself attracted to Dr. Grind and wonders if she should have ever agreed to being part of The Infinite Family Project. I adored PERFECT LITTLE WORLD. It's such a wonderful idea for a novel and Mr. Wilson's writing is just about perfect! I admit that I was drawn to the subject matter of this novel after hearing Mr. Wilson talk about it. The premise is fantastic, but I knew the author would explore love, parenting and families in a special way. And I wasn't wrong -- this book is not only entertaining with wonderful characters, but it is truly insightful into relationships and life! You have to admit that the premise is a good one. Who hasn't wanted some help at some point with bringing up their kids? But living with ten families for ten years is bound to have some problems. So, of course, the novel explores the ups and downs of the families' lives. Needless to say, there is lots of drama and funny moments; however, there are also some touching ones as well. It kind of reflects life! I really fell in love with Izzy. This young girl was willing to do whatever it took to take care of her son... and be part of a family. She didn't have a good family life, or even a good experience with her first romantic relationship; however, she wanted to make things right for her child. Her insights into the other nine families as well as the experiment were so wise for such a young person. I couldn't help but root for her as she spent years living with these people. I also found the Dr. Grind's character to be interesting. He had a very unusual childhood that left him with a lot of baggage. He had become a leader in his field and was definitely dedicated to his project; however, that didn't make him a happy and complete adult. Like Izzy, he wanted to do what was right for others for a greater cause; and I found that I wanted him to work through his past issues and find some peace. As entertaining as PERFECT LITTLE WORLD was, this book is so much more than just a fresh story. This novel is one of the best I've read about life... and love... and families. It's smart, funny, and truly thought-provoking; and I think every reader will find something to relate to in this story. As a result, I do think it would make a wonderful book club selection. I wasn't able to find discussion questions but I'm certain most book clubs would find plenty to talk about! 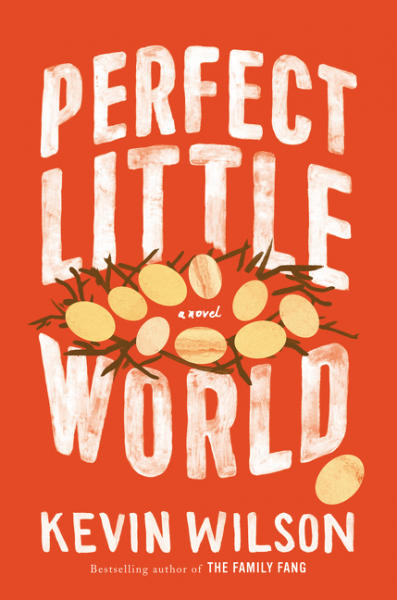 Overall, I adored PERFECT LITTLE WORLD and highly recommend it to fans of literary fiction! I received a copy of PERFECT LITTLE WORLD at this year's SIBA. Hearing him speak was so much fun! I need to get with it and read one of his books - this one sounds terrific! I just read this on myself! I was totally entranced by the whole premise. I was sad when it ended. I would love to see how the kids and family's adjusted to life in the "real" world when the project was over! This does sound like a great premise and that it would be perfect for a book club. Just added to my TBR list!! !